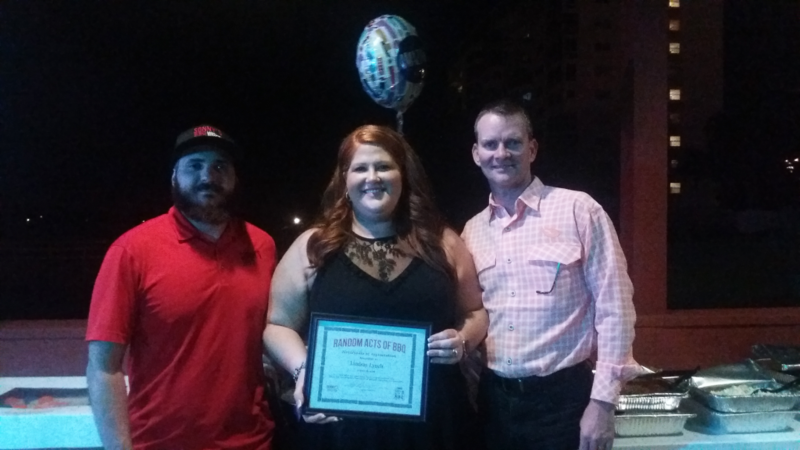 The Sonny’s BBQ of Sebring, FL hosted a Random Acts of BBQ for Lindsay Lynch, who was recognized for makin’ a difference in her community. Lindsay is heavily involved at Highlands Little Theatre, a local nonprofit theatre that puts on live plays. There, she’s served on the board for several years and made generous donations towards the updates of sound systems and lighting. In 2003, Lindsay started a summer youth program at the theatre, giving children the opportunity to learn about plays. This hands-on program has allowed the kids to jump in and get involved with set design, stage crew, and acting in the plays. She organizes a live show at the end of the summer, where the kids get to perform for their community. Lindsay has also volunteered at Sebring Youth baseball since 2010 and served as Vice President of the program for the last 3 years. Thank you for everything you do, Lindsay.